Have you gone nose blind to household odors? Check multiple measures of your home's air quality. This air quality monitor has a fan onboard that allows REAL-TIME accurate monitoring of formaldehyde (HCHO), total volatile organic compounds (VOCs), and -Large variations or 9.999 TVOC readings do not indicate an error as this instrument is a sensitive electronic nose; environmental TVOCs vary much and high TVOCs often can result from interference from benign fragrances or odors. -Calibrate if 0.000 indoor readings noted or with new device. -Adjustable alarm for various HCHO levels and auto-shutoff timing (up to 2 days). As the only US based retailer of this item, we have a chemist on staff to answer any technical questions. We also include a 20+ pgs eBook on Gas & Air Quality Hazards and Updated Manual emailed at time of item delivery. MULTIFUNCTIONAL & SCIENTIFIC - This indoor air quality monitor accurately assesses multiple measures of air quality including concentrations of formaldehyde (HCHO), total natural & synthetic volatile organic compounds causing most odors (TVOC), and fine particulate dust matter measuring <2.5 microns in size (PM2.5) which travel deeply into the respiratory tract, reaching the lung alveoli and can worsen asthma. PORTABLE TESTING - Spot check indoor air quality anywhere or leave device on for continuous monitoring up to 2 days. This easy-to-carry air quality tester can help monitor air quality at home, in the car, and in hotel rooms. The 2200mAh battery provides portable power when DC 5V micro USB charging is not available. Information is displayed on a clear 2.8 color LCD display. ADVANCED FAN & SENSORS - This air quality monitor has a built-in fan to quickly draw in ambient air to allow REAL-TIME measurements. It incorporates a laser sensor to measure levels of dust particles and has a second electrochemical semiconductor sensor to measure formaldehyde and natural/synthetic organic compound levels. HEALTHY HOME? - Is your family suffering from sick building syndrome? This air quality tester detects organic compounds like formaldehyde which has suspected links to nasal cancer and lung cancer emitted from many household materials. By measuring particulate pollution, an air pollution monitor can also help you know when asthma may worsen and when to change your home's air filter. ORIGINAL DESIGN & USA BASED SUPPORT - We have Midwest-based technical staff including a chemist to answer any questions you have. Also included will be a 20+ page eBook on Gas and Air Quality Hazards. We have worked with the supplier that holds this air quality detector's design rights so you can be confident this item is tried and tested. Have you gone nose blind to household odors or dust? Check multiple measures of your home's air quality. 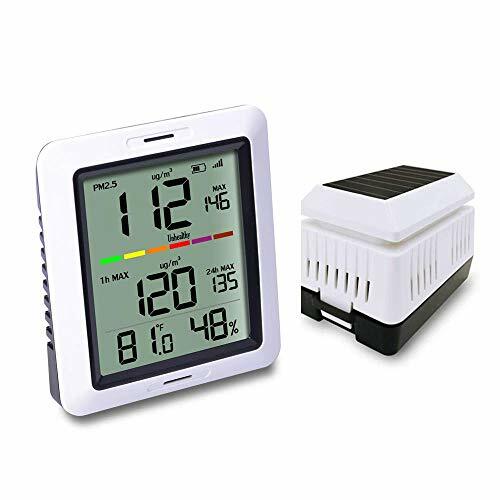 This air quality monitor has a FAN onboard that allows REAL-TIME accurate monitoring of temperature (in C), humidity, formaldehyde (HCHO), total volatile organic compounds (TVOC), and micron-sized fine particulate dust (PM2.5/PM1.0/PM10). Formaldehyde is an environmental carcinogen yet odorless at lower concentrations. Detect low levels of airborne TVOCs not perceivable to the human nose. See when you need to change your home's air filter. Watch the levels of indoor total volatile organic compounds and formaldehyde drop when the windows are opened. Learn where air quality is poorer and where your allergies can worsen. Allergies that are difficult to control with unexplained coughing, runny nose, and shortness of breath may be signs of sick building syndrome. -If the HCHO, temp, or PM2.5 is inaccurate, use the "Sensor Set" Menu found under SET (press D), then SENSOR (press A) to further calibrate device readings. -Calibrate if 0.000 indoor readings noted. 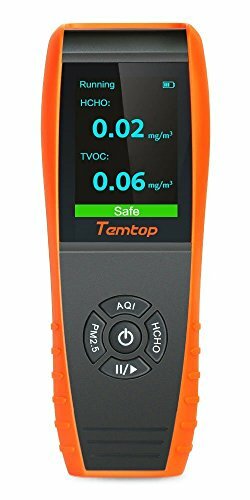 -Large variations & 9.999 TVOC readings do not indicate an error as this instrument is a sensitive electronic nose; environmental TVOCs vary much and high TVOCs often can result from interference from benign fragrances or odors. -Air Pollution Level vs. air quality index (AQI) are separate & different assessments of air quality. As the only US based retailer of this item, we have a chemist on staff to answer any technical questions. We also include a 20+ pgs eBook on Gas & Air Quality Hazards and Updated Manual emailed after purchase. 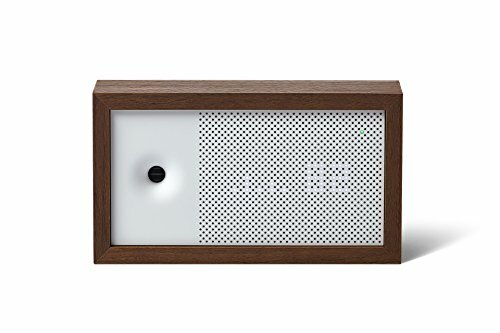 MULTIFUNCTIONAL & SCIENTIFIC - As our newest model, this indoor air quality monitor accurately assesses temperature in Celsius, humidity level, and multiple measures of air quality including concentrations of formaldehyde, total natural & synthetic volatile organic compounds causing most odors (TVOC), and fine particulate dust matter (PM2.5/PM1.0/PM10) which travel deeply into the respiratory tract, reaching the lung alveoli. PORTABLE TESTING - Spot check indoor air quality anywhere or leave device on for continuous monitoring. This easy-to-carry air quality tester can help monitor air quality at home, in the car, and in hotel rooms. The lithium battery provides portable power when DC 5V micro USB charging is not available. Information is displayed on a clear 2.8 320 x 240 pixel color LCD display. ADVANCED FAN & SENSORS - This air quality monitor has a built-in fan to quickly draw in ambient air to allow REAL-TIME measurements. It incorporates a laser sensor to measure levels of dust particles and has a second electrochemical semiconductor sensor to test air quality including formaldehyde and natural/synthetic organic compound levels. Do you know what's in the air you're breathing? Indoor air can be 5x more polluted than outside, due to everyday factors like paint, furniture, carpet, air fresheners, toys, and much more. Your air quality affects allergies, asthma, focus, sleep quality, skin and your overall health. Awair tracks invisible fine dust and chemicals in your air and gives you personalized recommendations to help you stay safe and healthy. Awair gives you the knowledge you need to improve your indoor environment and take control. Awair covers up to 1,000 sq ft and works with iPhone iOS (8 or later) and Android (Jelly Bean 4.3 or later). 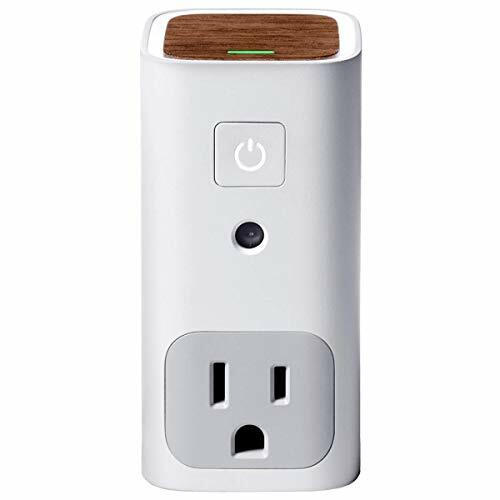 Connects with Amazon Alexa, Google Home, IFTTT, Nest, and more. 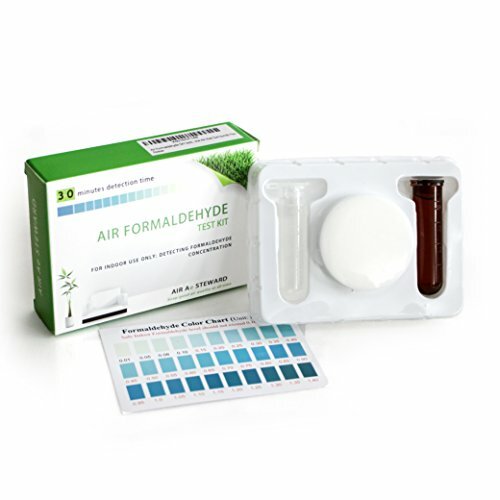 The Air Formaldehyde Test Kit was developed to determine the concentration of Formaldehyde (HCHO) in indoor air. Please keep away from children and if there is any contact with skin or eyes immediately rinse the area with water. We use latest chemical solution based on international standards in regards to Formaldehyde problem around the world. Formaldehyde (HCHO) - is a colorless, flammable gas at room temperature and has a strong odor. Exposure to formaldehyde may cause adverse health effects. SIMPLE, FAST and ECONOMIC way to determine whether Formaldehyde Gas (HCHO) is present in your home environment. This test kit is suitable for all living areas up to 270 square ft. (25 square meters). One kit per one room/item, if you would like to inspect your entire house we recommend buying the same amount as the room quantity. Better air quality - healthier family. NOTE: The longer the test area kept closed before measuring formaldehyde the more reliable results you get. Example: if you close the room for 8 hours and turn off all ventilation, air purifiers or anything that can affect the air than after measuring Formaldehyde you will get results of what the concentration is for such conditions. (Possible scenario: what is the formaldehyde concentration during 8 hours sleep with all windows closed). Six easy and well-explained steps with English manual will give you trustworthy results in 30-50 minutes time. Please keep the air temperature and humidity unchanged as much as possible during the test. This test will provide only visual results of what is the concentration of Formaldehyde in the room and should only be used for home or office environment and not compared to industrial equipment. If Formaldehyde Gas is present in your environment we recommend purchasing an air purifier or any other Formaldehyde removal technology to protect yourself and family. Since long-term exposure to Formaldehyde can cause serious health problems. Please store the test kit prior use in a dry and dark place. The expiration time is 2 years from the production date. Please see the packaging. If there are any questions or you need any assistance please contact us via email, or ask questions here. Our support team is here for you 24/7. Do you know what's in the air you're breathing? Truth is, indoor air can be more polluted than outside, affecting allergies, asthma, eczema, sleep, and much more. Awair Glow tracks toxins and chemicals in your air and gives you personalized tips to help you stay safe and healthy. Glow plugs directly into the wall and can also turn on your non-smart devices the moment your air quality drops (or at certain times throughout the day). Glow covers up to 1,000 sq ft and works with iPhone iOS (8 or later) and Android (Jelly Bean 4.3 or later). Easy understanding user interface-Fahrenheit Display Only!!! 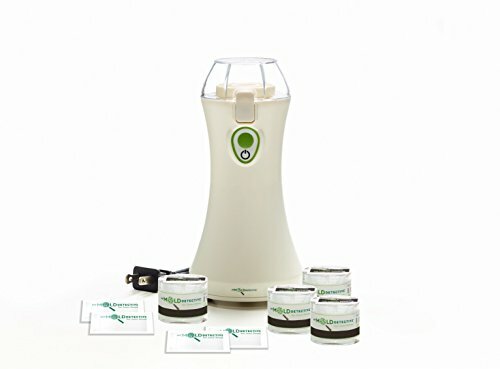 Its finally here, My Mold Detective, LLC (MMD) has developed a cost effective, easy to use, and industry validated mold spore "air" sampling system for the DO IT YOURSELF consumer. You can now screen the mold levels inside your home or office with My Mold Detective's Mold Test Kit. The My Mold Detective Mold Test Kit is our industries First cost effective re-usable Mold Testing Pump. No more renting expensive professional pumps, and no more UN-reliable Petri-dish mold testing kits. Test like the PROS with your MMD100 Mold Test Kit, by MyMoldDetective, LLC. Remember it is important to understand that testing your air for elevated mold is a great first step in the process. Spore Trap air sampling is one tool in determining if your property has a mold condition that requires professional attention. Onsite assessments, additional testing, protocol development and professional remediation & 3rd Party Post Remediation Verification (PRV) testing may also be necessary to solve your properties mold issue. Why is My Mold Detective the best first option? Once you've decided to STOP ignoring the symptoms in your property, musty odors, allergenic effects, occupant complaints - you now have a reliable first step option to self-test problematic areas yourself, quick and easy to understand results. Don't spend $600 to $1500 to determine you don't have an elevated mold issue. Additional Lab Fees Required at time of online sample registration Standard lab analysis is $35 per sample. Check multiple measures of your home's air quality. FAN onboard allows REAL-TIME accurate monitoring of temperature (in C/F), humidity, formaldehyde (HCHO), total volatile organic compounds (TVOC), and micron-sized fine particulate dust (PM2.5/PM1.0/PM10). Formaldehyde is an environmental carcinogen yet odorless at lower concentrations. Detect low levels of airborne TVOCs not perceivable to the human nose. This device was featured with cabin filter testing during 2018 CA fires (see photos). This air quality monitor with built-in stand can continuously monitor your air quality and when you need to change your home's air filter. Watch the levels of indoor total volatile organic compounds and formaldehyde drop when the windows are opened. Learn where air quality is poorer and where your allergies can worsen. Allergies that are difficult to control with unexplained coughing, runny nose, and shortness of breath may be signs of sick building syndrome. -Device auto-calibrates by taking it outdoors for 10+ minutes in fresh air (calibrate on 1st use). As the only US based retailer of this item, we have a chemist on staff to answer any technical questions. We also include a 20+ pgs eBook on Gas & Air Quality Hazards emailed at time of item delivery. 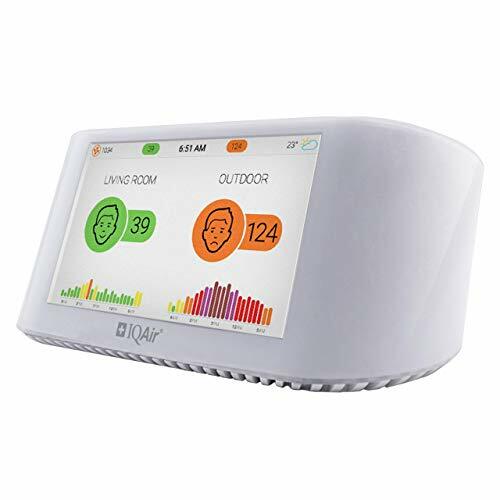 MULTIFUNCTIONAL & SCIENTIFIC - This indoor air quality monitor accurately assesses temperature (in C/F), humidity level, and multiple measures of air quality including concentrations of formaldehyde, total natural & synthetic volatile organic compounds causing most odors (TVOC), and fine particulate dust matter (PM2.5/PM1.0/PM10) which travel deeply into the respiratory tract, reaching the lung alveoli. PORTABLE TESTING - Spot check indoor air quality or leave device on for continuous monitoring. 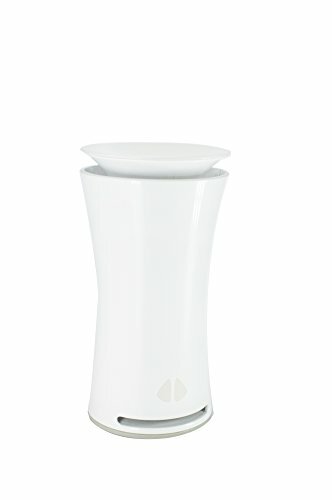 Built-in stand allows air monitor to be placed unattended anywhere. This easy-to-carry device can help monitor air quality at home, in the car, and in hotel rooms. The lithium battery provides portable power when DC 5V micro USB charging is not available. Information is displayed on a clear 2.8 320 x 240 pixel color LCD display. ADVANCED FAN & SENSORS - This air quality monitor has a built-in fan to quickly draw in ambient air to allow REAL-TIME measurements. It incorporates a laser sensor to measure levels of dust particles and has a second electrochemical semiconductor sensor to measure formaldehyde and natural/synthetic organic compound levels. Air monitor also auto calibrates in fresh air. it impacts your health and can cause respiratory issues such as allergies/asthma/ COPD/ lung cancer etc. Good, Moderate, Mild, Unhealthy, Severe and Hazardous, to help you know the air quality and take corresponding measures to reduce the loss. 2)PM 2.5 current and max value for 1h/24h/since last reset. 4)Every 10 minute the unit will receive wireless PM 2.5 sensor. 1) Indoor temperature measure range: 14 to 140 F(-9.9 to 60 C). 2) Indoor humidity measure range: 1% to 99%. Accuracy +/- 3% RH (@25 C. , 30%RH to 80%RH). Rechargeable & Wireless: the PM2.5 sensor is powered by 2 rechargeable batteries and with built in solar panel as backup power(all included); also with battery power condition indicator. Note: Please full recharge the PM2.5 sensor before use. 10 LEADING CAUSES OF DEATH ARE LINKED TO INDOOR AIR POLLUTION We spent around 90% of our lives indoor, where air is usually up to 8x more polluted than outdoor. 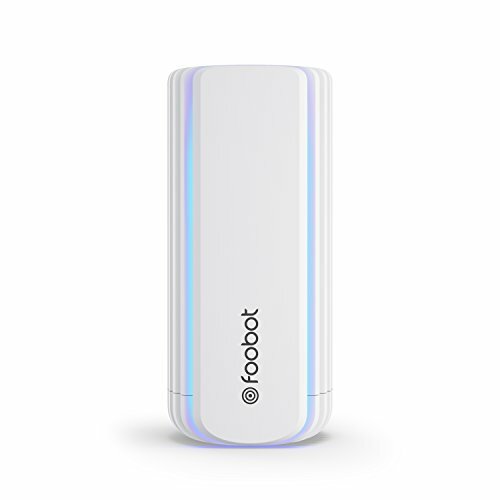 Foobot, the first complete indoor air quality level indicator, was developed to easily and quickly make you aware of the harmful particles and chemicals you breathe in your home. As daunting as it sounds, Air Pollution is one of the main causes of premature death due to its role in diseases like ischaemic heart, stroke or COPD, not to mention its negative effects on asthma and other respiratory ailments (source: WHO). Foobot was created to let you control the air quality of your home so you can take the right measures to ensure you and your family live and breathe in a healthy environment. BENEFITS EASY TO SET UP: just plug the device in, download the app and follow the instructions. Within 5 minutes you will be getting readings on your phone. SIMPLE APP: available for Android and iOS. Very intuitive and easy to navigate through. It keeps a record of events so you can learn what actions triggered a warning on the Foobot. . DISCREET AND CLASSY WARNINGS: in addition to the LED on your Foobot, App's background colour is synced with the device and it changes simultaneously according to air quality measured. . HIGHLY ACCURATE: Berkeley National Lab determined Foobot to be among the most reliable monitors for PM2.5 readings. 6 DAYS CALIBRATION PERIOD: Foobot's sensors need 6 days to warm up and to be fully accurate. So please leave the device powered and connected during the first 6 days. it can directly transform the concentration of pollutants in the air into visual data and provide air quality for you to effectively safeguard the health of your family. The latest 9-IN-1 air quality detector measures PM2.5, PM10, particles, HCHO(formaldehyde), TVOC, AQI, temperature, humidity and histogram function. The new histogram function can reflect the changes on PM2.5 directly for the latest 12 hours. Temtop advanced third-generation laser particle sensor has a lifetime up to 20,000 hours. Combined with the unique particle swarm optimization algorithm, it makes particle measurement more accurate and stable. The pre-calibrated electrochemical sensors will accurately capture formaldehyde molecules accompanied by the detection function covering a wide range of organic pollutants. You may already know just how undetected dust can cause flare-ups in asthma and allergies, and changes in air pressure can kick joint pain and headaches into high gear. But did you know the air inside our living and working spaces can also affect our health? Indoor air often contains pollutants that can take a negative toll on our health, from our respiratory function and skin health to sleep, concentration, comfort, and more. But you don't have to live in - or breathe in - the unknown anymore. With uHoo, you can monitor your indoor air and react to create the safest possible space for you and your loved ones. THE WORLD'S MOST ADVANCED MONITOR - You can breathe freely and easily when you know what's in your air. Only uHoo's air quality monitor provides a fully comprehensive analysis by measuring indoor temperature, humidity, dust, toxins, nitrogen dioxide, carbon dioxide, ozone, air pressure, and more. A BREATH OF FRESH AIR - Your asthma, allergies, and sleep quality all suffer when indoor air is unclean. Don't let impurities impacts your overall health, happiness, and productivity. uHoo tests the air, and the uHoo mobile app streamlines your data for personalized tips to achieve the safest atmosphere possible. SMART & SEAMLESS - Clean breathing in any indoor environment is finally possible. The uHoo system syncs with any IFTTT-compatible device. It works with Nest, Roomba, Amazon Alexa, Google Assistant, and more for anything from scheduled cleanings to 24/7 climate control. You can even record your data on Google Spreadsheet using IFTTT. EFFORTLESS CONNECTION - With uHoo, advanced technology is simpler than ever. Just plug in your uHoo, connect to WiFi, and receive round-the-clock feedback through 9 precisely calibrated sensors. All you need is a stable network and a smartphone or tablet with iOS 9 or newer or Android 4.3 or newer. SIGH OF RELIEF SUPPORT - For complete peace of mind, uHoo provides a 1-year warranty. If you have any questions or concerns about your product, please don't hesitate to reach out to our customer support team. After all, you are uHoo's #1 priority! Brand: Gain Express | Manufacturer: Gain Express holdings Ltd.
Beautiful life is the goal we have been pursuing and always aspire to. Always check the air quality problems and protect your family's health. 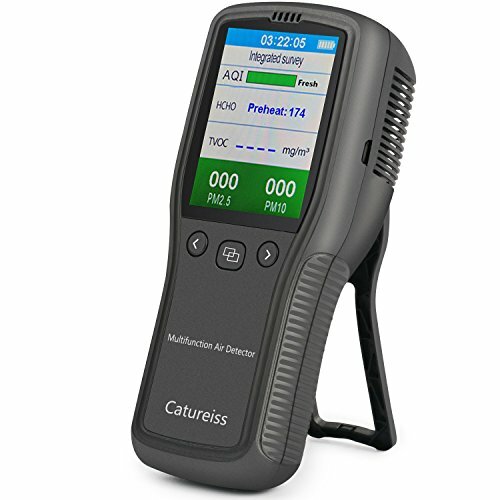 The air quality tester is what you need. CATURIESS MULTI-FUNCTION AIR QUALITY detector is a good choice. 1, 6 detection functions, accurate detection of formaldehyde in the air (HCHO) /TVOC/PM2.5/PM10/ benzene, etc. Air quality all-weather monitoring curve record and result analysis. 2. Suitable for home, indoor, outdoor, automobile and other environmental testing, easy to carry, easy to operate, anytime and anywhere to test the air quality, to protect the health of family members. 3, Three independent sensors are used: formaldehyde sensor, PM2.5 laser sensor and TVOC sensor. Anti-jamming multi-layer filtering mode, German 12 AD intelligent chip, digital signal amplification, software and hardware anti-jamming algorithm, data more accurate. 4, Please calibrate it before using it for the first time. (please refer to the user guide / manual). Test item: Hcho, TVOC, PM2.5, PM10. Battery Capacity: 2200mAh Lithium Battery. Charging Temperature: -10 -45 . Storage Temperature: -20 -50 .
time. We will serve you wholeheartedly 24 hours. 1. INTELLIGENT AIR QUALITY DETECTOR: 6 kinds of detection functions, can accurately detect the content of formaldehyde (HCHO) / TVOC / PM2.5 / PM10 / benzene in the air. Air quality all-weather monitoring, curve recording and result analysis. 3 ADOPT 32 BIT ARM INTELLIGENT CORE PROCESSOR AND 12 BIT HIGH PRECISION AD SMART CHIP: The ARM processor is responsible for electrochemical sensing. High speed and complex operation of laser PM2.5 and TVOC sensing. Open the laser age of air detection. AD chip makes digital detection signal amplification and anti-interference software algorithm, data more precise. 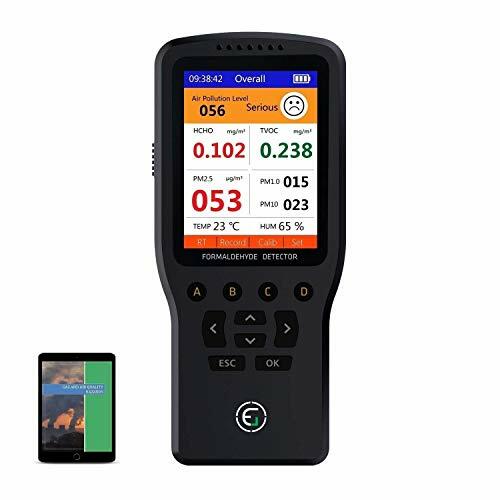 4, 2.8 INCH TFT HIGH-DEFINITION COLOR DISPLAY HIGH-END DETECTOR, intuitive data, clear interface.THE FOUR DISPLAY PAGE STYLES ARE Win, 00, 01, 02, and 03, which are freely set.Built in 2200mHA large capacity lithium battery,STANDBY TIME IS LONG. It can be charged by USB cable. 5,PROFESSIONAL AFTER-SALE: FBA distribution, safe and fast. Product life-long warranty, if need help, please contact our customer service, professional customer service 24 hours online. Please NOTE, this is 5TH GENERATION FORMALDEHYDE AIR RAPID TEST KIT with multi-color scale chart, with all English packaging & User Guide. Other sellers may be selling 3rd/4th generation products with only single-color scale chart or with Chinese packaging. Just bought some new flooring or furniture with engineered wood? Recently did a home renovation or moved into a new home? Feeling sick or allergic in your new house or new car? Fear for Formaldehyde in your nail polish products? Formaldehyde exists in most of furniture and building materials made with pressed wood or particle board. Researchers found that Formaldehyde exposure is associated with nasal cancer and nasopharyngeal cancer, and possibly with leukemia. In 1995, the International Agency for Research on Cancer (IARC) concluded that formaldehyde is a probable human carcinogen. 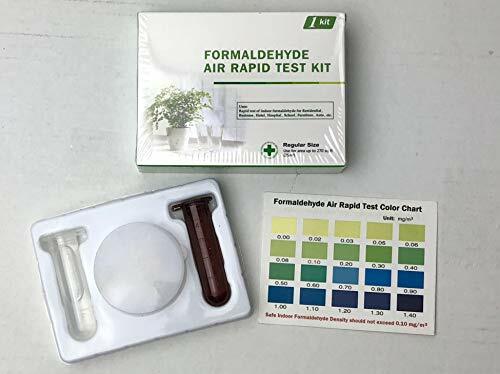 This test kit is very useful in detecting Formaldehyde level of your indoor air and test your furniture or automobile's air quality. Formaldehyde is a colorless, flammable, strong-smelling gas that is used to manufacture building materials and produce many household products. Formaldehyde sources in the home include nail polish products, pressed wood products, cigarette smoke, and fuel-burning appliances. When exposed to formaldehyde, some individuals may experience various short-term health effects. Formaldehyde has been classified as a human carcinogen (cancer-causing substance) by the International Agency for Research on Cancer and as a probable human carcinogen by the U.S. Environmental Protection Agency. Research studies of workers exposed to formaldehyde have suggested an association between formaldehyde exposure and cancers of the nasal sinuses, nasopharynx, and brain, and possibly leukemia. Note: This is 5TH GENERATION with multi-color scale chart and all English packaging & User Guide. Other sellers may be selling 3rd/4th generation products with only single-color scale chart or with Chinese packaging. Rapid and semi-quantitative testing of air formaldehyde without the need for any equipment. Great for on-site testing of formaldehyde inside a car, a room or furniture. Detection Range 0-1.4 mg/m3 with 20 easy to read multi-color scale intervals. 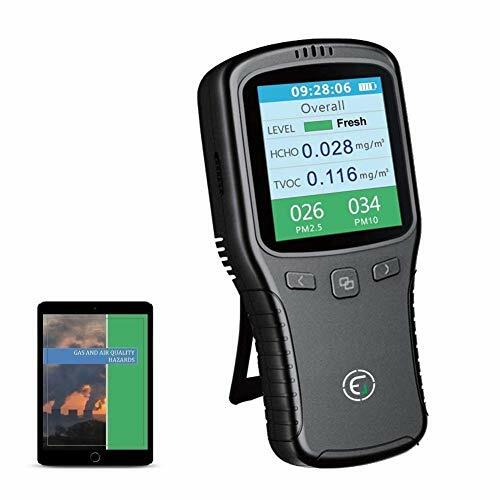 Know What's in the Air You Breathe - IGERESS multifunctional air quality detector, Formaldehyde Monitor TVOC(including benzene) Testing PM2.5/10/1.0/TEM/HUM with real time air quality data record and analysis, smart time display, and HCHO removal calculation. 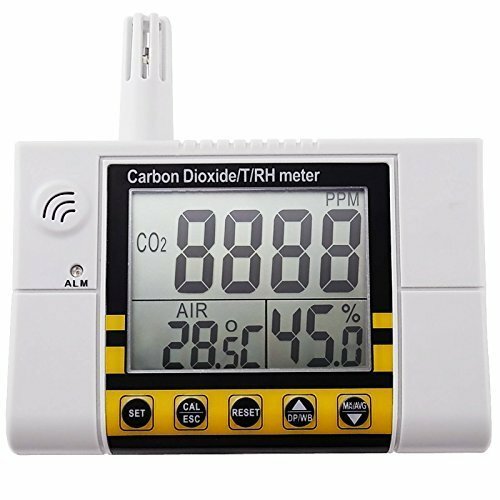 Air Level on the Overall interface - Large LCD Color Screen with English operation system easy to read the testing result, more convenient to use for indoor and outdoor air detect. 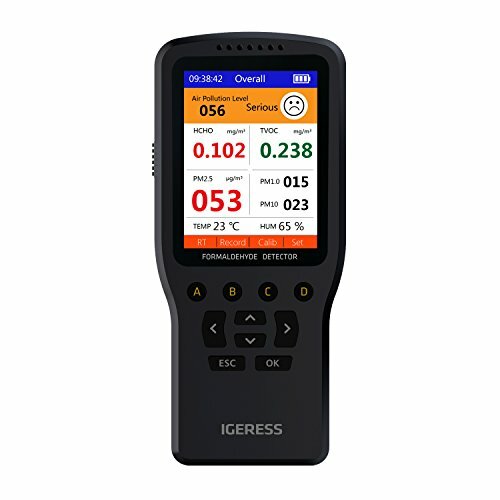 IGERESS Multi-function Air Quality Monitor is easy to operate, we keep the most important and essential parts for a good air quality monitor - high accurate for testing! We adopting electrochemical formaldehyde sensor, TVOC sensor, PM Laser sensor, air quality sensor, with our smart chip, digital signal amplification for more accurate data. It can be widely used in household, office, car and many other environments. Latest Anti-interference Technology, adopting smart chip with digital detection signal amplification, hardware and software arithmetic, more precise reading. Convenient to carry around, perfect for the environments, such as house, car and office , etc..
Test item: HCHO, TVOC, PM1.0/PM2.5/PM10. 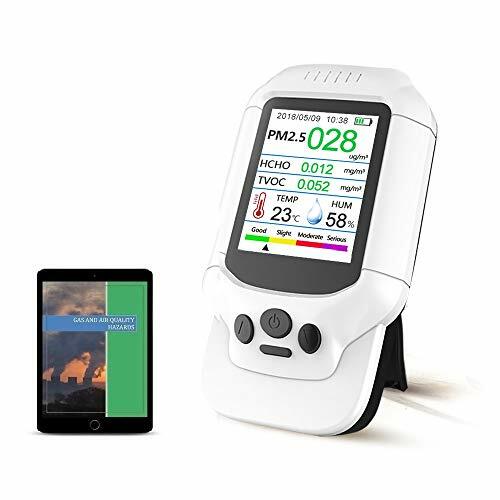 Multifunctional and upgraded: This upgraded air quality detector accurately testing air quality of formaldehyde (hcho), tvoc, pm2.5, pm1.0, pm10, temperature and humidity, to ensure the health of your family in all domains, real time testing with data record and analyzed with chart indicate, hazard level with time display! Portable: It's easy to carry the intelligent air quality monitor that can help detects air quality level at home in kitchen, bedroom and etc. Or in office, in the car, travel, camping and party, etc. Test the air quality anytime anywhere to be away from harmful of tvoc, hcho, small particles pm2.5/1.0/10. New design and mold: Newest unique mold and design with 10 function buttons make the testing more accurate and usefu! Built in high-capacity lithium battery with long stand by time, can be charged via usb cable, large lcd screen with english interface easy and clear to read! Defend health: Built-in a calculator as a reference for remove hcho and haze, an ideal multifunction testing tool to monitor the air quality with 6 levels to indicate the hcho/pm2.5 pollution level, a safeguard for family health. If exceed standard, alarm prompt. Easy to operate: Do calibration well on initial use, otherwise, data may be inaccurate. Easy to calibrate it with pressing c button. This 3-IN-1 detector is exclusively designed for particles only. It monitoring PM2.5, PM10 and has the histogram function. The high-precision laser particle sensor has a lifetime up to 20,000 hours. Combined with the particle swarm optimization algorithm, it can accurately measure haze and smog particles as small as 0.3um, making particle measurement more accurate. Easy to operate with simple system settings through few function buttons. Large TFT color LCD screen intelligently display the testing results, easy and clear to readThe new histogram function can visually reflect the change on PM2.5 concentration within the last 12 hours. 3 buttons for 3 functions; Simply press each function button on the front panel to enter corresponding PM2.5 or PM10 or histogram info page. Large TFT screen and rich display make it clear and easy to read data, even with battery indicator light to help you check battery at any time. GEARDON air quality monitor to help people live healthier. It helps detect harmful HCHO and TVOC around your room in the real time. Remind you to ensure the PM1.0/PM2.5/PM10 within the safe level. 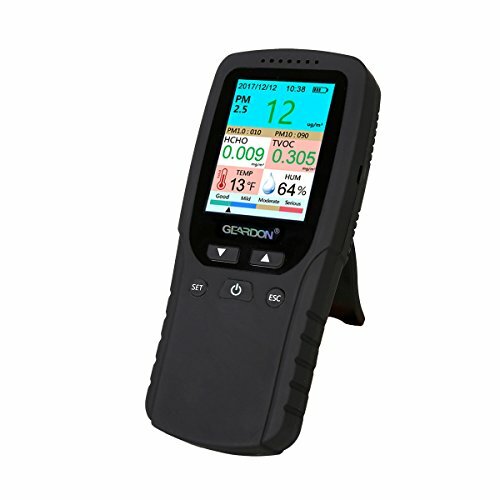 Choosing Geardon air quality detector and get a better and healthier life for your family. 10.If the device has not been operated for 5 minutes, it will enter to standby mode, if there is no operation within two hours, it will be turned off automatically. -Please read the user manual carefully before use, or contact us by email for assistance. -The data will be in a high level at the first time you use, but don't worry about this, it will go down soon because this is the raw data from the packing box. [EASY TO SET UP]: At the first time using, the formaldehyde detector will take you just 30 - 60 minutes to calibrate the data. After that, it can be used directly everytime when you turn it on. No need any calibration again. [NOTE]: Please fully charge before using for the first time. And in order to make the TVOC test value more accurate, the TVOC test needs wait 200 seconds to test properly after each boot. [AIR QUALITY GUARDIAN]: If you worried about the air quality around you or your children, please choose GEARDON air quality monitor. It will remind you how is the quality level in the real-time. [HIGH SENSITIVITY SENSOR]: Built in PM 2.5 laser sensor and electrochemical sensor, it has high accurate testing. It's more precise than the general models in the market now. GEARDON air quality detector will focus on keeping the air quality of your home within safe level. [MULTI TESTERS]: It is available for different kinds of data including PM2.5/HCHO/TVOC/AQI/PM1.0/PM10/TEMP/HUM, to ensure the health of your family in all domains.